This past week was defiantly better than the first of the season. The good news is we're beginning to see fresh salmon on a regular basis. Not the beginning of the season we were all hoping for but it's getting better with each day. I spoke with managers from other rivers namely the York, St-Jean, Dartmouth, Matapedia and Restigouche, they're all experiencing the same, a later run than normal. Looking at the weather and river levels we are at least two weeks behind schedule. It's only going to get better! Over the past few days our guides are seeing an encouraging numbers of fresh salmon. Lucinda Dashwood with her first Grand Cascapedia salmon, congratulations Lucinda! The Bonaventure is running at early June levels and is still a bit stained, but clearing nicely. Not too many places to wade yet, almost all fishing is from canoes. The Grand Cascapedia is also running high but cleared well as the week progressed. The Petite Cascapedia is clear and a bit high, it opens on Sunday . The guides have been floating all the sections of our rivers this past week. Rivers can change over the winter as some pools can fill in while others just get better. 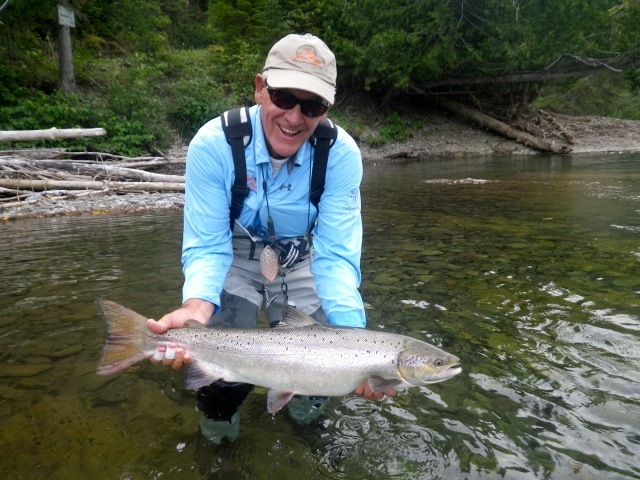 Sir Edward Dashwood with a fine Grand Cascapedia salmon, way to go Edward! The week got off to a slow start but then quickly changed. Smiles around the lodge weren't difficult to find and fishing stories were plentyful. High rod for the week, Sir Edward Dashwood with 4 nice fish landed, a 36, 30, 16 and 12, with two others lost. His lovely wife Lady Lucinda landed a bright 12 pounder and did manage to tease a couple of others to her fly. Edward owns the world renouned E.J.Churchhill Gun company. Not only a fine shot i'm sure, but a great fisherman as well! Tim Grey landaed two fine salmon a 20 and 33 pounder respectively and his lovely wife Jenny a 28 pound silver bullett. Rene Barnes and Charles Dewhurst both landed great looking fish in the upper twenties and lost a couple of others. One more for the books, congradulations Edward! This weeks high tides brought in a nice run of fresh salmon. The past few days have been very encouraging as our pools are beginning to hold fish. The guides are seeing salmon in most of our lower pools and a good number higher up as well. The hot fly's have been the Silver Rat, Nagli, Green Highlander.....Davie McPhail's version and the Blue Charm. Even though we haven't taken on on a dry yet, we had a few up close for a look. Next week we'll fool our first one on a bomber!